Walter Loucks from Beaverton Ontario enlisted in the RCAF on February 28, 1941. Posted to No. 1 Manning Pool in Toronto. After completeing the training there he was assigned to guard duty at No. 1 Equipment Depot a posting that was not unusal during this point in the RCAF history, as training facilities were still being built while the number of recruits grew and temporary duties needed to be found for them. Eventually he was posted to No. 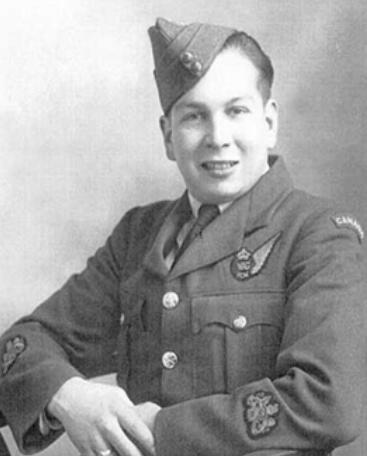 4 Wireless School located in Guelph as a Wireless Operator /Air Gunner he continued on to No. 7 B & Gunnery School in Paulson Manitoba. Completeing his WAG training on June 8th 1942. As with all RCAF personnel sent to Britian he reported to No. 3 Reception at Bournemouth England. Then continued his training at No. 32 O.T.U. and also No. 82 OTU. He began his operational missions on July 9th. with an established crew captained by F/O Jack Bell, who had been posted to 419 squadron on June 18th 1944 and were already flying operations when WO Loucks joined them as their new WAG.